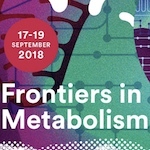 The Frontiers in Metabolism – Mechanisms of Metabolic Diseases meeting will take place Sept. 17-19, 2018, at the Discovery Building in Madison, Wis. Biochemistry professor Dave Pagliarini, who is the director of the Metabolism Theme at the Morgridge Institute, is the meeting organizer. Pagliarini says the meeting will bring together a diverse group of leaders who investigate the basic mechanistic underpinnings of metabolic disorders and pioneer new approaches for probing and quantifying metabolic processes. The broad swath of topics will span cancer metabolism to lipid dysregulation to mitochondrial signaling. UW–Madison biochemistry professor Alan Attie, an expert on the genetics of metabolic diseases like diabetes, will be presenting his work in a talk titled “Genetics and Genomics of Type 2 Diabetes.” Biochemistry Emeritus Professor Dave Nelson will be presenting a special session on the university’s history of studying metabolism. This meeting is conducted by the Morgridge Institute for Research in partnership with UW–Madison and the Lausanne Integrative Metabolism and Nutrition Alliance (LIMNA).